Republican Senator Rand Paul of Kentucky told a north suburban audience that if he is elected president, tax returns would be one page long. 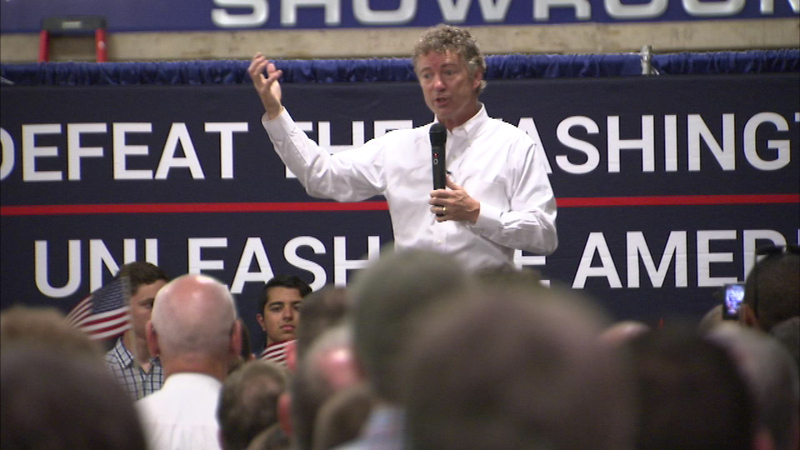 NILES, Ill. (WLS) -- Republican Senator Rand Paul of Kentucky told a north suburban audience that if he is elected president, tax returns would be one page long. Paul, who spoke Saturday afternoon at Royal Kitchen and Bath in Niles, said that if elected, he wants everyone to pay the same tax rate. He says many businesses are moving overseas because their taxes are too high. "How are they succeeding with all of the obstacles we place in their way?" he said. "We have a tax code that is 70,000 pages. You saw what I'd like to do with it. Burn it, put in in the wood chipper." Paul went on to say Congress should vote on every regulation. He was critical of what he sees as a power grab by President Barack Obama.